KUBINKA /Moscow Region/, August 22. /TASS/. Russia’s state hi-tech corporation Rostec has demonstrated the first serial-produced version of the latest Sosna short-range air defense missile system at the Army-2018 international military and technical forum outside Moscow, the Rostec press office said on Wednesday. "The new mobile system has successfully passed state trials and is set to replace the Strela-10M air defense missile system in the Russian army," Rostec said. The Sosna strikes targets within a range of 10 km and at an altitude of 5km day and night. 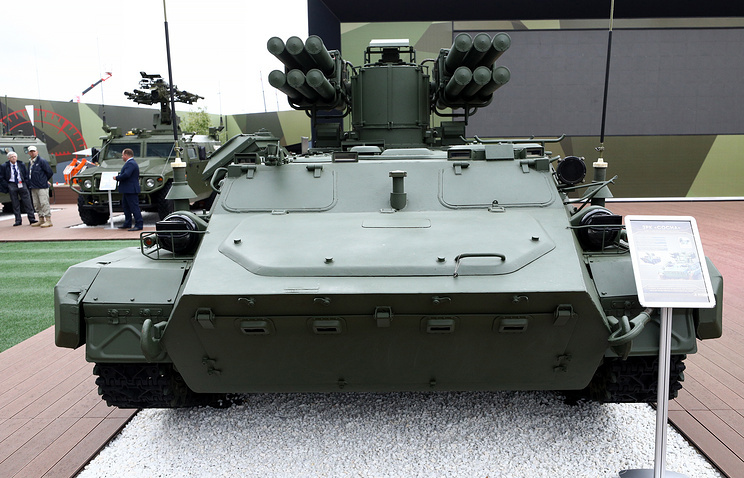 One combat vehicle carries 12 small-size Sosna-R surface-to-air missiles and is equipped with the high-precision electro-optical jam-proof control system. The Sosna is designated to protect battlefield troops from precision weapons and air reconnaissance means. "The missiles’ small weight and dimensions allow the air defense system to operate without a special transporter-loader. The system’s rotating part is designed as a combat compartment, which can be mounted on various transporting vehicles with a lifting capacity of over 3.5 tonnes," the Rostec press office said. The Sosna air defense missile system has been developed by the Nudelman Precision Design Bureau (part of High Precision Systems within the state hi-tech corporation Rostec). As was reported earlier, High Precision Systems completed the state trials of the Bagulnik air defense missile system in 2017. According to open sources, the Bagulnik is the combat module of the Sosna air defense missile system. The latest Sosna short-range air defense missile system will be delivered to the Russian troops in the immediate future, Head of the Nudelman Precision Design Bureau Vladimir Makeyev said at the system’s presentation at the Army-2018 international military and technical forum. "Preparations are underway for the system’s serial production. We hope that we will see it in the troops soon," he said. Sosna Chief Designer Vladimir Ukleyev said that the air defense missile system has a passive sight system, which ensures its concealment. The system’s new missile has a warhead weight of 7.2 kg and a strike range of up to 10km and can engage ground targets, he said. The Sosna can also deliver fire while on the move, he added. "During the trials, fire on the move was conducted at speeds of 25-30 km/h. 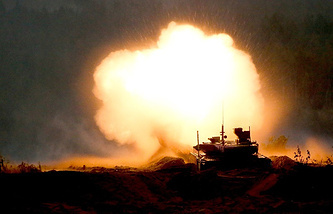 A tank formation does not move at large speeds," the chief designer said.